Looking for more information about how our downloadable products work? You can start using our downloadable add-on and sim software almost immediately after purchase and installation with our new and even more user-friendly system - and you still get Just Rewards points on every purchase! All download transactions are 100% secure and are covered by our Terms & Conditions and customer service guarantees. It’s easy – just add download products to your shopping cart and buy them in the same way as our boxed products. You can even combine download products and boxed products in the same online order. Once you have paid for your download software you will immediately be given a link on screen to download it, and full instructions for unlocking and installing the product will be provided during the installation process. These details will also be sent to you via e-mail, along with an e-mail order receipt. NOTE: For larger downloads you will actually be downloading a small program which, when run, will download all the required files to your computer and then let you install the game at your convenience. 1. Once you have downloaded your product, locate the file you have downloaded and double-click on it to start the unlocking process. 2. It will automatically take you to the authentication screen to confirm your purchase. Follow the on-screen instructions to unlock the product. 3. Make sure you are connected to the Internet and select the ‘Already paid’ option. 4. Enter your e-mail address and password from your Just Flight / Just Trains account and select LOGIN. 5. 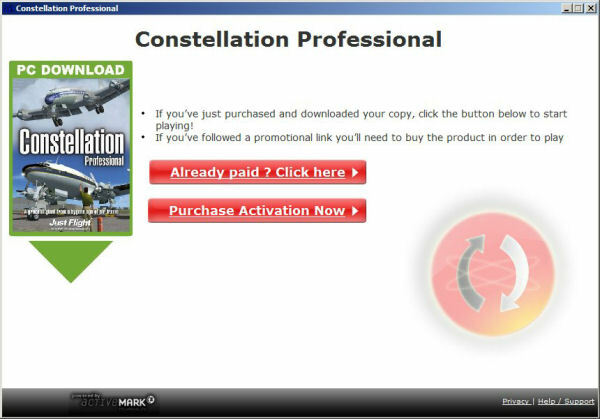 Your purchase will be confirmed and the main installation will start automatically. 6. Follow the installer prompts to install the product. 7. You can uninstall and re-install the product on your PC as many times as you wish – there is no need to unlock or re-authenticate. 8. To install the product on a new PC or if your PC is re-formatted, simply download the file again (or use the original downloaded file if you still have it available) and follow steps 1 to 5. 9. You can unlock your product up to three times. Unlocking is only needed if you wish to install the product on a different machine or if you have made major changes to your current machine such as reformatting and reinstalling the whole system. If you need to unlock your product any more than three times please contact our Technical Support team. In exactly the same way as you’d pay for any other product bought from this website. All payment transactions will be conducted through our secure website. How long will it take to download the product? The time required will depend on the file size of the download and your Internet connection speed. As a guide, you should be able to download 100Mb in about 25 minutes on a 512Kb connection or 5 minutes on a 2Mb link. Can I speed up the download process or do anything to reduce the risk of interrupted downloads on a dial-up connection? You may want to use a download assistant/accelerator such as GetRight (shareware) or Download Accelerator Plus (free) but note that Just Flight cannot guarantee the functionality of these or similar programs. How do I install and unlock the software once I have paid for it? Full instructions will appear on screen once you have bought a download product. These will also be sent to you in an e-mail for future reference. I haven’t received the e-mail order receipt and confirmation of the unlock instructions. These are sent out almost immediately after you buy a download. If you do not receive them, it may be that your spam filter has blocked them as they are sent from an automated source. If this is the case, please check your spam folder or filter settings. Can I install the software on a PC without an Internet connection? In order to authenticate your purchase and unlock the game your PC needs to be connected to the Internet. You can’t unlock the game and then copy it onto another PC. It must be unlocked on every PC and you can unlock your game on up to three different PCs. What about registering the product and technical support? There is a Support section on this website for all our products, whether supplied in a box or downloaded. You do not need to register any of your products to access this Support section. What happens if I change my PC or need to reinstall the software? 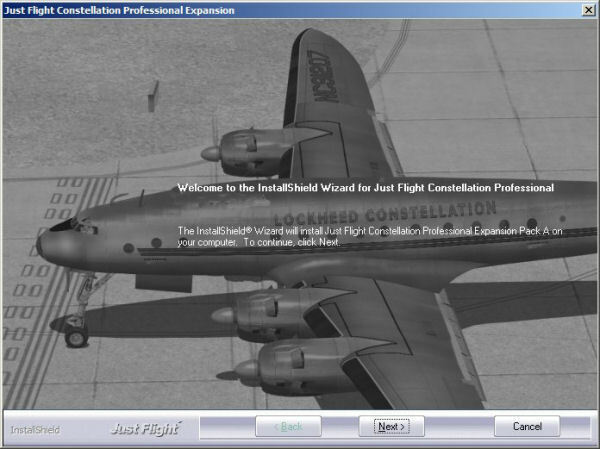 Once you have unlocked the product you can install it as often as you like on the same computer system. If you change your computer system or your licence files are ‘broken’ (perhaps due to a re-installation of Windows or a hard drive malfunction), you will need to unlock the software again. 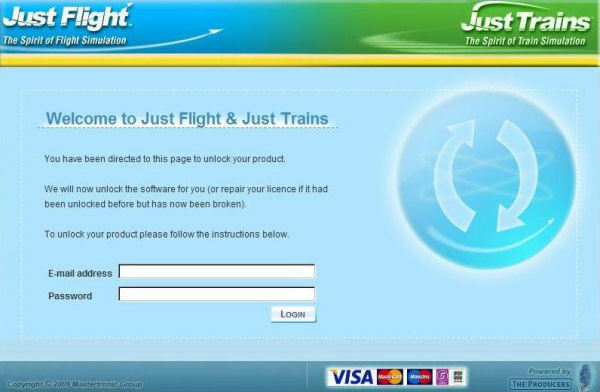 On 16th December 2009 Just Flight and Just Trains upgraded the unlocking system for their download products. For titles bought before this date you need to enter your unique activation code (keycode) that was sent by e-mail to unlock or re-unlock the product. After that date you simply enter, when prompted, your e-mail address and password, from your Just Flight or Just Trains customer account. Note that the keycodes are unique and only valid only for one unlocking on one machine – you will not be able to unlock the software more than once with the original code. At the time of purchase you will receive an e-mail with a separate code for unlocking the software in an instance such as those mentioned above – save this somewhere safe for such an eventuality. Re-downloading/installing products, how do I do it? Re-downloading is very simple. Go to the Account tab on the Just Flight or Just Trains website, login and select the ‘order history’ section. In here you’ll find links to re-download your files. Note that for products purchased prior to 16th December 2009 you’ll be directed to a list of files where you can choose the appropriate file to download. 1. Once the file has been downloaded, double click it to run the installer. 4. You will receive another e-mail with a new set of codes, store this somewhere safe for the future. If you need any assistance with redownloading/reinstalling your product, please contact the downloads team. What happens if the product doesn’t work? If you encounter any problems or have any queries regarding the download or unlock process please contact us here. What if I don’t like the product once I have installed it? According to EU law you have the right to return an unopened product (bought online) within seven days after purchase and get a refund on the price. Unlike a boxed product, a software licence cannot physically be returned, so unfortunately we are unable to provide refunds on download software. Can I order more than one download product in a single transaction or a mixture of download and boxed products? Yes. If you order more than one download product in any one transaction, you will receive installation instructions for each of them in separate e-mails. If you buy a download and one or more boxed products, you will see installation instructions for the download on screen as soon as you have completed the purchase and the boxed product(s) will be shipped out to you as normal. Are the manuals included with the download products? Yes – we believe that a comprehensive manual is a necessary feature of any add-on. After installing your download product, click on the Windows Start button on the bottom left of your desktop and select Programs>Just Flight. There you’ll see an entry for the download product with one or more PDF manuals included. (You’ll need Acrobat Reader to open them. If you don’t already have it, download it from the Adobe site here. Please note that the Just Flight money back guarantee does not apply to download products.